The tap-dancing T-Rex is worth the price of admission alone. Because, honestly, how can you not find that delightful? Delightful is an apt word to describe The Bone Wars: The Curse of the Pathological Palaeontologists, the newest show from Punctuate! Theatre, written by Matthew Mackenzie. I’ve long been a fan of MacKenzie’s work, with Sia and Bears ranking among my favourite Edmonton theatre shows in the past few years. Bone Wars is a departure into family-friendly territory, allowing MacKenzie to dispense with the more nuanced, thought-provoking and often disquieting commentary that marked his earlier works. Instead, Bone Wars goes straight for deadpan announcements/condemnations/judgements about treaty rights, fossil fuels, climate change, women’s rights. But in a funny way: these lines are delivered, bluntly and with no preamble, quite literally out of the mouths of babes – in this case, recited by one of the four young characters on stage. 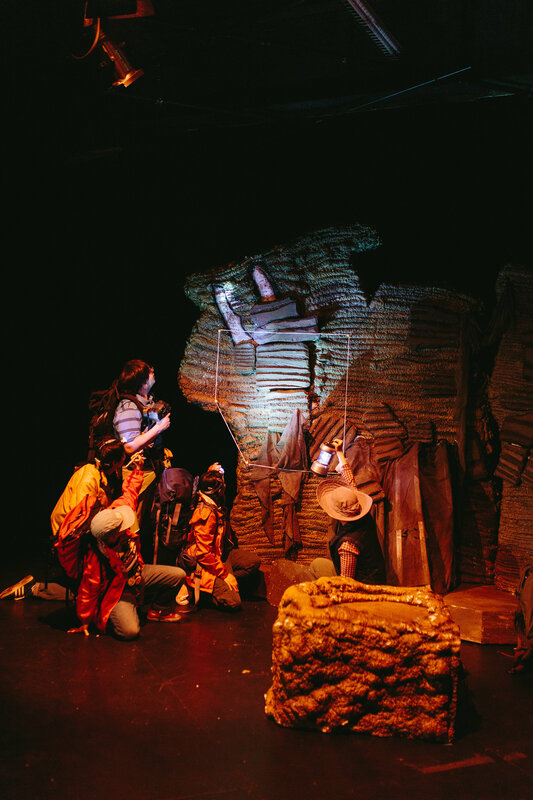 The plot has these four kids accompanying a PhD candidate (Chantelle Han) on a hunt for dinosaur bones in the Southern Alberta badlands. A freak thunderstorm has them all seek refuge in an abandoned mine, where they soon realize they aren’t alone. A quintet of Klondike-era women quickly bursts on to the scene, in a magical realist flourish akin to some of the twists in MacKenzie’s Bears – not to mention reminiscent of the work of another Alberta writer, Robert Kroetsch, who also wrote about the badlands (albeit in a much different context). They’re like a Canadiana version of Macbeth’s witches, complete with spooky incantatory utterances, effusive arm gesturing and lessons in early Alberta history. The ladies need to enlist the children’s aid in breaking the curse that has kept them confined in that mine for the past 100 years: the Curse of the Pathological Paleontologists. It’s a reference to the Great Dinosaur Rush: an infamous and heated rivalry between paleontologists Othniel Charles Marsh and Edwards Drinker Cope, played here by the uproariously funny Leona Brausen and Davina Stewart (respectively). In their haste to make the most exciting and robust paleontological finds while simultaneously undermining each other’s career, both Marsh and Cope resorted to unscrupulous and even illegal tactics. And so the play proceeds from here, at a pace that’s breathless if not quite breakneck. The child characters have endless energy, whooping and cheering and careening around the stage. It’s a clear winner for the younger crowd – every one of the kids present on opening night was spellbound. And following the example set by Pixar, it keeps the adults entertained too, with its lively energy and nuggets of aforementioned socio-political commentary that’ll have you chuckling in between knowing groans. MacKenzie’s script is peppered with a few lines that are absolute gems, though their delivery is at least half of what makes them so ticklish. “We were just trying to escape climate change!” bursts out one of the kids. “26 Albertosaurus tragically lost their lives 63 million years ago,” deadpans another. Amber Borotsik’s movement is inventive and interesting, up to her usual calibre. It features spasmodic, jerky dance sequences that wouldn’t be out of place in a Lady Gaga video, along with a number of highly entertaining contortions in which the performers pantomime dinosaurs and dino bones. 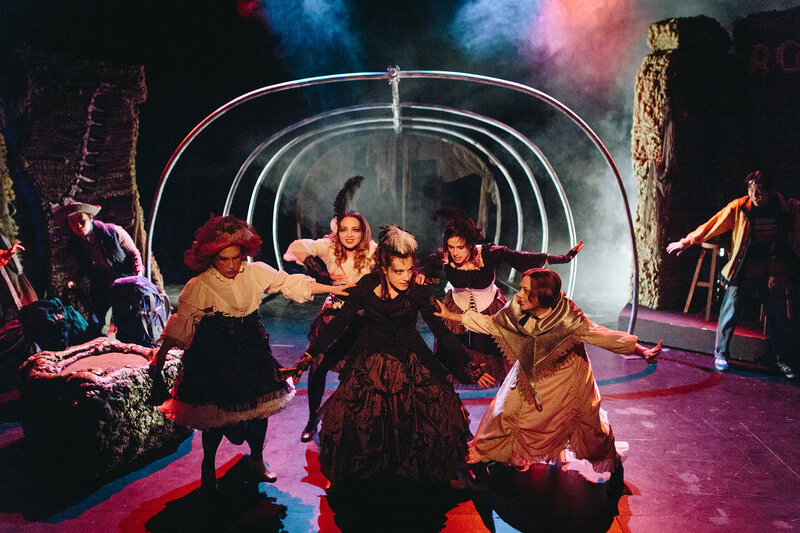 There’s a whiff of Catalyst Theatre’s esthetic in Bone Wars, centered chiefly around the five women. Undoubtedly a good chunk of that is due to Brianna Kolybaba’s costume design: gothic-inspired black and white affairs with ruffles, feathers and a few odd flourishes, like a large spiny ruff encircling the neck of the lead Klondike gal, Morna (Beth Graham). Actually, Graham’s presence also might account for why I thought Bone Wars had a Catalyst vibe, since I just saw the latter’s newest work, Fortune Falls – co-written by Graham and Jonathan Christenson – a few months ago. Live music is always a welcome addition to any show and here it provides the added bonus of well-timed slapstick sound effects. 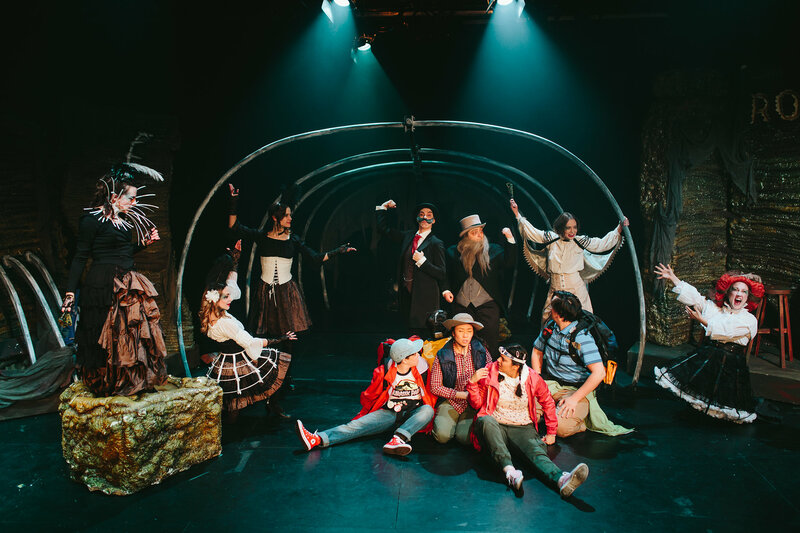 I tip my hat to co-composers Allyson MacIvor and Stefan Kijek, with assistance from Murray Utas – the latter of which also plays a show-stealing cameo as the Mad Trapper. So, if it isn’t obvious by now: take your kids to Bone Wars. Children’s shows aren’t often as fun for the grown-ups as they are for the kids, even if you’re a parent with a particularly high tolerance for juvenile silliness. Also: thanks to Punctuate! for the big bowl of Dino-Sours in the lobby. I know they were only there because they are dino-themed, but I am fully in favour of this becoming a permanent tradition in Edmonton theatre.